Robotics in general terms needs to think past outdated and outmoded perceptions of what robots should look like… Mori warned us many years ago… our human-robot interactions need more imagination now… probably more than ever before. Health and social robotics are very personal, ontological even… and personal robots require characterisation which enable and encourage anthropomorphic and zoomorphic tendencies present in most of us, whether we like it or not. Surely a mental health related robot should have the ability to interact and interface on an individualised basis. If you don’t particularly like the look of an automaton (or a human for that matter) you are much less likely to interact with it/them affectively or over time. Autistic or otherwise! 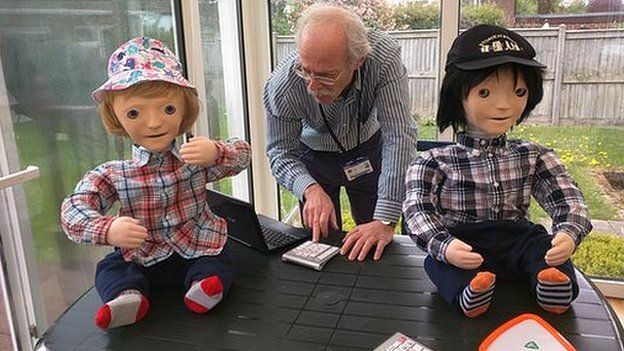 I appreciate that humanoid robots can at least attempt to replicate social procedures for imitation/replication etc and I’m certainly not criticising pioneering research into humanoid robots and autism… but I’m afraid Kaspar is not exactly my ideal robot for research into mental health related issues. A personal robot from cradle to grave is ambitious to even suggest but probably the direction we need to be looking in first… and an iphone called Siri or a Nokia called Cortana are just not up to the task… and yet the potential is evident. I would like a robot which can look after me when mental health becomes my personal issue… it should affect me in the ways a Cat or Dog does but also take care of the hoovering… also be my counsellor and also monitor my health… even when internal inspections may be required… a personal elderly friend spent 182 seperate days last year going to a hospital for ‘inspections’. I also want it to replace my home phone, laptop, TV, Router, Server, Cloud, Bose speaker, going to my local Doctor/hospital, Endoscopist etc etc… and it could pretend it cares for me too… just along as it doesn’t look like Frankenstein and behaves, when required like Phillip Pullman’s adaptation of Aristotle’s eudaimonia (Eros)… I’ll be happy… not much to ask is it… autistic or otherwise!